We saw a flock of buffleheads today, but with my shaking hands and their tendency to swim farther and farther away the closer you move toward them, it was impossible to get a good shot of those little bastards. (I’m not cursing! They are, technically, bastards.) The problem is that they move one foot to or fro, and my autofocus is focused on where they were a second before, and so the pictures all end up blurry. But now I’m home and I’ve watched a video about how to use manual focus with my camera, so maybe tomorrow I’ll have better luck. Maybe. 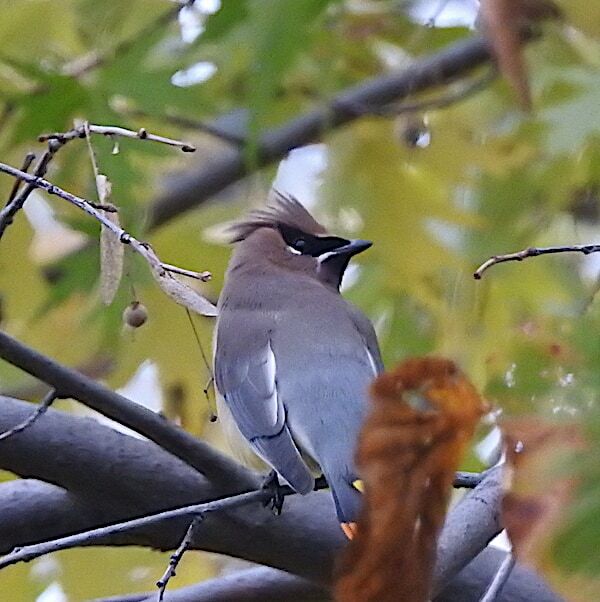 Cedar Waxwing, October 27, 2017, in Madison, Wisconsin. I didn’t see the red wingtips that many waxwings have, but the tail tip (obscured by the brown leaf in the foreground) was a nice bright orange. I love cedar waxwings. They seem so unobtrusive at first glance—heck, often you don’t even see them on first, or second, or even fifth glance because they camouflage themselves so well. But they’re subtly colorful, with pale yellow bellies and those bright yellow or orange tail tips, and some with red spots like bangles on their wings. And the mask! It’s so elegant. Not to mention the foofy coif. If you’d like to compare this waxwing to others, I’ll do like I always seem to do and refer you to All About Birds. It has a nice page on cedar waxwings that shows several of the color variations.